See where to buy extra users for your Whatagraph account. To buy additonal users or data sources for your account, you need to go to Subscription settings in your main home screen menu. 2. Click on Add more. 3. 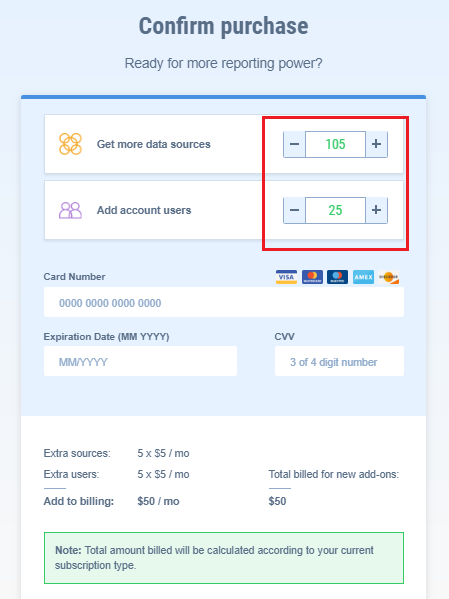 In your add-on calculator, select how many extra account users or data sources you need. The system will adjust your monthly payments based on your selection. 4. Proceed with order and add-ons will be automatically added to your account after the payment is successfully processed.